As the first skyscraper in the city of Dortmund was built from 1926 to 1927 which is now known as "Dortmunder U" ehem. Gärund storehouse of Dortmunder Union Brewery, which bears since 1968, the four-sided "U" on the roof. The size and close proximity to the main station of the Union Brewery predestined to transport many raw materials and products by rail from the town. 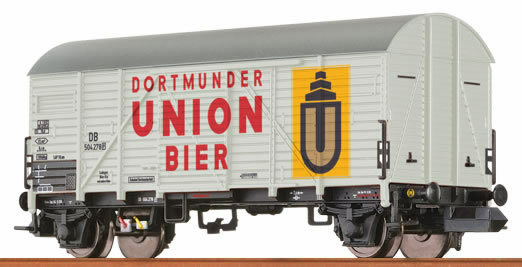 Thus, the Dortmunder Union brewery, like many other breweries owned freight wagons, which were set as private car at the German Federal Railroad had. In order to strengthen the awareness of the trademark, such trolleys and bins were usually provided with the advertising of the respective brewery.